After rigorous validation for its positive impact on improving forecast accuracy, scientists at the NRL Marine Meteorology Division have transitioned the assimilation of GPS Radio Occultation (RO) data into the operational U.S. Navy Global Prediction System (NOGAPS). 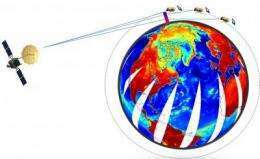 The assimilation of GPS RO reduces the NOGAPS upper-tropospheric and lower stratospheric temperature biases, introducing a complementary interaction with the radiance observations from other sensors being assimilated into the system. "Satellite measurements often exhibit systematic biases when compared to the forecast model and can be due to biases in the forecast model, or the fast radiative transfer model used in assimilation. They can also be due to sensor issues, inadequate knowledge of the underlying spectroscopy, or introduced through data processing and quality control procedures," said Dr. Nancy Baker, head of NRL's Data Assimilation Section. "Partitioning of the biases is difficult, but experience has shown that an effective bias correction strategy is essential for positive analysis and forecast impact from radiance assimilation. GPS-RO helps to provide a relatively unbiased reference point for the assimilation and bias correction." The technique involves a low-Earth orbit (LEO) satellite receiving a signal from a global positioning system (GPS) satellite. As the LEO rises or sets with respect to the receiver, the signal passes through multiple layers of the atmosphere, which then becomes refracted along the way. The bending angle or refractivity profiles are derived from precision measurements of the time delay of the signal. The magnitude of the refraction depends on the atmospheric density profile which is a function of temperature, pressure, and water vapor content in the atmospheric layer. The NRL Atmospheric Variational Data Assimilation System - Accelerated Representer (NAVDAS-AR), a four dimensional-variational (4D-Var) data assimilation system, serves as the front end of NOGAPS and has the capability to assimilate the bending angle from GPS radio occultation. The bending angle observations assimilated into NAVDAS-AR are profiles containing approximately 250 measurements between the surface and 40 kilometers. Before assimilation of GPS data, the lower stratospheric model fields exhibited systematic biases of the uncorrected innovations (observed minus simulated radiances) in infrared radiances such as Infrared Atmospheric Sounding Interferometer (IASI) channels and microwave radiances such as Special Sensor Microwave Imager/Sounder (SSMIS) and Advanced Microwave Sounding Unit-A (AMSU-A) channels. Assimilation of GPS-RO data within NAVDAS-AR was made possible with the use of the Radio Occultation Processing Package (ROPP) developed by the European Organization for the Exploitation of Meteorological Satellites (EUMETSAT) Global Navigation Satellite System Receiver for Atmospheric Sounding (GRAS) Satellite Application Facilities (SAF). ROPP allows for the direct assimilation of the bending angle from GRAS, Constellation Observing System for Meteorology, Ionosphere and Climate (COSMIC), Gravity Recovery and Climate Experiment (GRACE-A), Terra SAR-X, Satellite de Aplicaciones Cientifico (SAC)-C, and Communications/Navigation Outage Forecasting System (C/NOFS). The addition of bending angle assimilation using ROPP was found to reduce the bias correction applied for AMSU-A, SSMIS, IASI and AIRS sensors, allowing for assimilation of additional channels from these sensors. Together, these changes significantly improve the NOGAPS forecasts and tropical cyclone track predictions at all lead times. The observation impact assessment using the adjoints of NOGAPS and NAVDAS-AR shows that the GPS bending angle observations have a consistent beneficial impact on the forecasting system, by reducing the 24-hour forecast error as measured by a moist tropospheric energy norm. In the 1960s, NRL and the Aerospace Corporation independently developed concepts for systems that could provide precise, all-weather, real-time, 24-hour, worldwide navigation information. The NRL concept was proven in 1967 with the launch of its Timation I satellite and in 1973 was merged with the Air Force program to form the Navstar GPS program, the basis of modern GPS.